Originally I got a Global Sun Oven to dye yarn. People who dye yarn typically boil it in a large pot on a stove top on medium to low heat for a couple of hours. I couldn't see using gas for that long. I was thinking of resources and costs. I was also thinking that I never leave a stove or oven on when I'm not home for safety. I use large canning jars and fill it with my handspun yarns, natural dye materials (like seeds, barks of tree, roots,leaves etc. ), alum (or other mineral salts), and water. The canning jars lids prevent the heat from breaking the glass. The thermometers help me keep the temperature from getting too hot. One day I used the solar oven and made banana muffins for breakfast, dyed yarn in it in, then made corn bread for part of lunch, dyed some more yarn in it, then made shrimp/vegetable shish-ka-bobs for dinner. I love the feeling of being environmental when I use the solar oven. I now have two Global sun ovens. I wanted two so I could cook more things for meals. I think Global Sun ovens are well built and will last for years. I've had mine for at least six years. I also use my solar ovens as teaching tools in my third grade class. I'm curious to use the Hot Pot. It seems like it would be good for stews. Hot Pots look like they would be good for travel and camping because of its smaller size. My family is trying to live a simpler life and practice Urban Sustainability. On a sunny day you will see my solar ovens in my vegetable garden, near my urban backyard chickens. We also have solar panels on our roof. We are working on rain barrels next. Thank you again for your contributions to our site visitors, it is always great to hear of the many ways that people are using solar cookers to help save on our natural resources. You describe many things and practices that we try to do ourselves with solar, gardening, conservation etc. The more sustainable practices we can all learn to use the better it will be for everyone in the long run. Besides who doesn't like to save money, eat better, breathe easier and feel good all around? I just wanted to let you know that I chuckled a little when you listed all of the things you did with your GSO in ONE DAY. I've had those days too, where I'm shuttling food in and out of the oven all day, cooking a week's worth from 8 am to 5 pm. I'm often surprised at how hot the oven gets in the evening, and start tilting it at angles to keep it from going too high, especially for those foods where a nice slow and low is just right.. 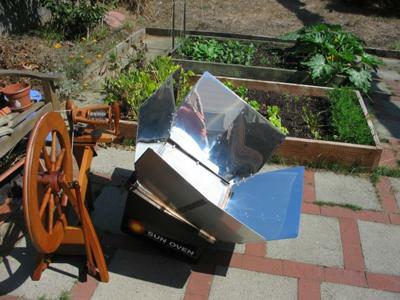 I am really excited by this application of solar ovens to heat water for dyeing yarns. This application has great potential in Asian countries [India, Sri Lanka and Bangladesh] where lot of textile workers use vegetable dyes and boil in a large kettle with fossil fuel or firewood. I have myself seen such kettles in small towns in Tamil Nadu state in India. I would feel that an open ,panel type cooker would be better as the dye-stuff may evaporate and coat on the glazing.